Areca seed (Binglang)-Areca catechu L.
Botanical Name: Areca catechu L.
Common Name: Areca seed, Betel nut. Part Used & Method for Pharmaceutical Preparations: The seeds from the ripe fruit are collected in winter or spring. They are dried in the sun, soaked in water and cut into slices. Meridians: Stomach and large intestine. 1. Parasites in the intestines (especially tapeworm): Areca seed (Binglang) is used with Pumpkin seed (Nanguazi). 2. Retention of food with abdominal distension and constipation or tenesmus in dysentery: Areca seed (Binglang) is used with Costus root (Muxiang), Bitter orange (Zhiqiao) and Rhubarb (Dahuang) in the formula Muxiang Binglang Wan. 3. 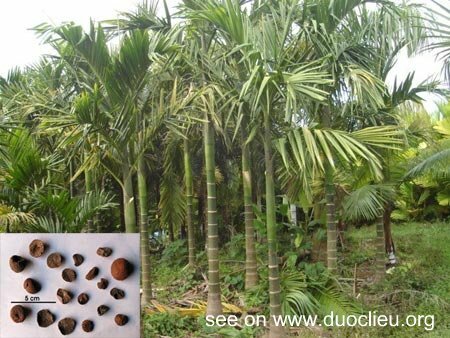 Edema: Areca seed (Binglang) is used with Poria peel (Fulingpi) and Alismatis rhizome (Zexie). 4. Swollen and painful legs: Areca seed (Binglang) is used with Chaenomeles fruit (Mugua), Evodia fruit (Wuzhuyu) and Perilla leaf (Zisuye). 5. Side-effect of vomiting caused by intake of the herb Dichroa root (Changshan): Areca seed (Binglang) used with Dichroa root (Changshan) can lessen the latter's side-effect. Cautions & Contraindications: This herb is contraindicated in a person with weakness of the spleen accompanied by diarrhea.